We decided to take a drive down the coast and catch a glimpse of several of the 30 beaches in the Taen area. Along the way we saw several dino signs so we decided to take the detour. 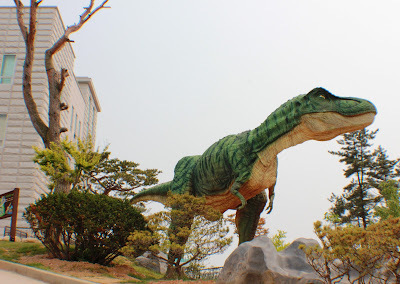 We found the main sign for Anmyondo Jurassic Park (also spelt Anmyeon-do or Anmyon-do) and drove the short 350 meters to the park. 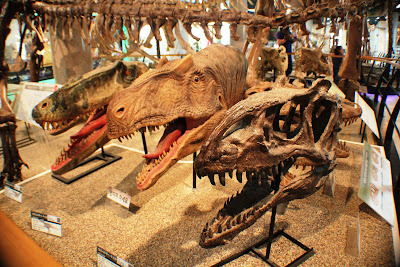 Admission: adults - 10,000, children under 12 - Free (this was our admission but the website translation lists it a little differently). Once we arrived there was a 2-story waterfall descending from the main building down to the parking lot. 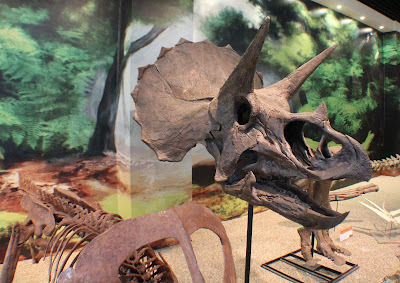 At the entrance to the museum was a large area with various statues and dino replicas like these all around. For the record: Cooper does not like mermaids. Had to hold mommy's neck for a bit after this pose. The first floor of the museum had an impressive display of all of the most famous dinos. 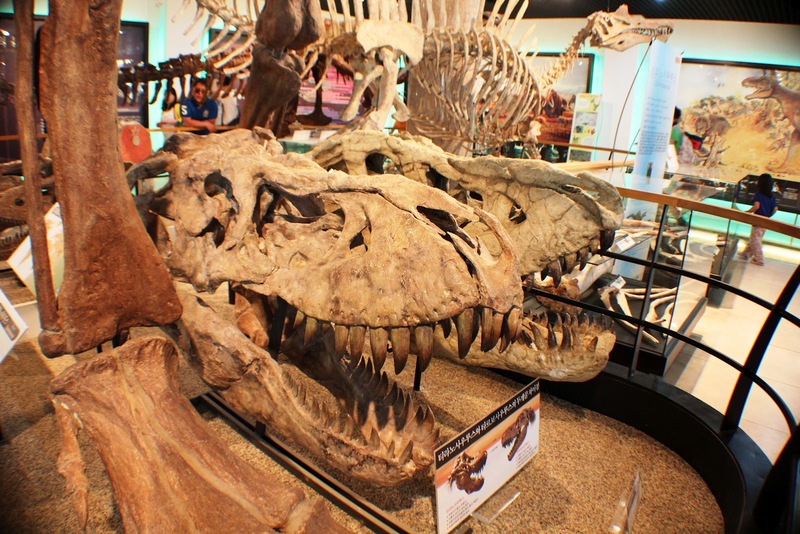 The T-Rex replica spanned much of the first floor and went all the way up through to the fourth floor. 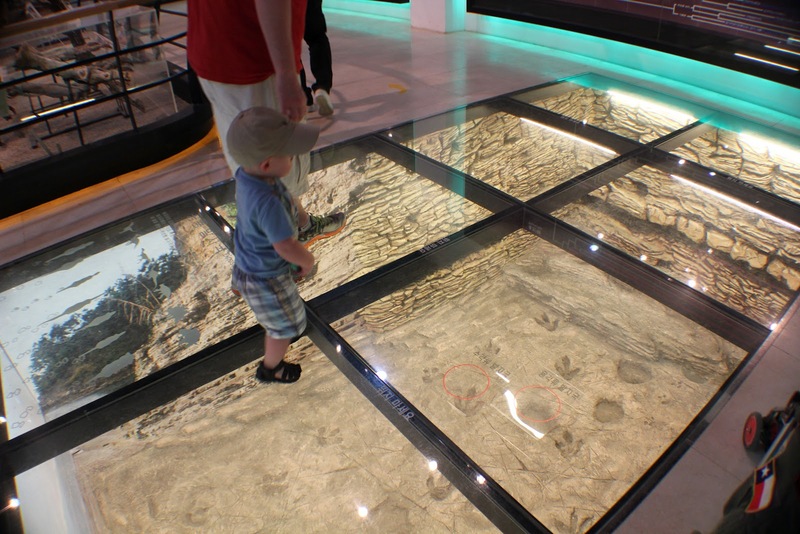 This dino park is famous for the footprints that were found here and they have been preserved under a glass floor. Cooper and daddy walked across each set to get a better look but I was more comfortable walking along the edges! The other floors included a really great selection of fossils and rocks and more great dino displays and interactive elements. To the right of the museum was an outdoor dino park with more replicas and rocks and statues on display. There also was a great Jurassic-Park looking waterfall and at the foot of the falls was a submerged dinosaur that was a great photo opp. Outside was also a pond, a rose archway, and even a little playground. The dino park was a great find! Cheers for going off the beaten path - even when you live somewhere that every direction feels like the beaten path. Looks like a cool place to visit. I don't blame Cooper about the Mermaid. She looks a little spooky! True Nancy although is is odd that he was much less afraid of the 4 story T-Rex? Ha! 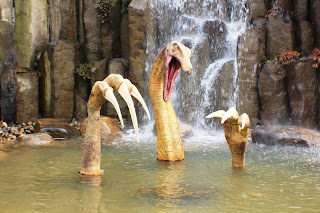 cool pic of Therezinosaurus under shower ! Big claws for a vegetarian though..